Have you been thinking about starting a blog? Whether you haven’t started yet, just hit publish, or even have been blogging for a while – I have a INSANE bundle that I know you’re going to love. My friends over at Ultimate Bundles have created The Genius Bloggers Toolkit 2018 which, in short, is 77 resources for only $97, which is a crazy 98% off. I know, it almost seems to good to be true. I promise it isn’t! 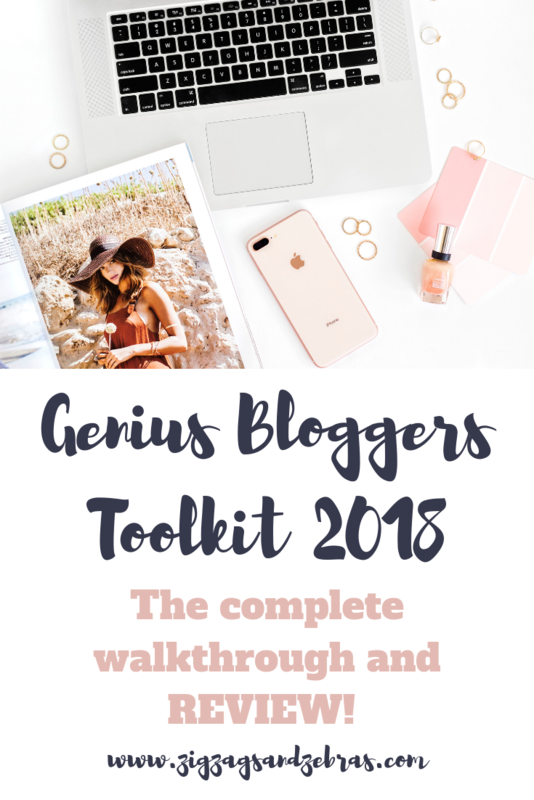 In this post I’m going to walk you through my Genius Bloggers Toolkit 2018 Review. Are you thinking about purchasing the bundle this year? You’ve come to the right place! I’m going to walk you through what’s included, and I’ve also included a review of the products that I’ve been able to work through so far (those ones will be in bold)! If you have any specific questions please feel free to comment or shoot me an email at jessica(at)zigzagsandzebras(dot)com. 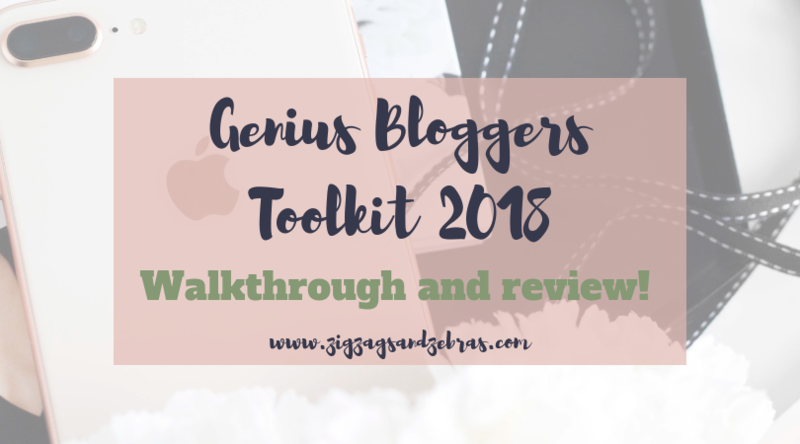 Now on to the Genius Bloggers Toolkit 2018 Review! This course was super helpful to me because I am definitely NOT a lawyer, but I understand all the different legal issues that come up with running a blog. This course helped me to make sure that my blog was GDPR compliant – it was extremely beneficial. This was a great (and under 30 minutes – for those without a lot of time) video that helps to walk you through the basics in regards to using social media, and the different legal issues that can come about! I’ve signed up for this club and been able to spend a bit of time so far to look around. There are a TON of different sections that help you with setting up your business, selling products, and more! I’ve just started working my way through the content inside this club but I’m excited to see how it will help me! There are plenty of different categories and places to connect with fellow bloggers. A great place to learn and chat! This is a great collection of well-shot stock photos to help with your blog images and social media presence. This is a great course where Chelsea walks you through the basics of how to set up your WordPress blog, and how you can earn money as a micro influencer. I loved this course from Laura of I Heart Planners! She walks you step by step how to create a printable in 2 separate programs. It’s also a fairly quick course meaning I was able to work through it in the morning – and I was so excited about it that I created 3 printables right away that will be available in the resource library! I can almost promise you that more will be coming as well as a result of that fantastic class by Laura. 3 months of Tailwind (a pinterest scheduling tool that has grown my pinterest reach an INSANE amount) – worth $45.00. 2 months of Scribe (electronic access to books, audiobooks, magazines, and more) – worth $17.98. 3 month shaker subscription to Podia (a way to sell courses, memberships, and digital downloads to your followers) – worth $237.00. 2 month subscription to Stencil (a visual marketing tool) – worth $40.00. Free site scan and content audit – worth $150.00. Wow! That was A LOT of resources – 77 in fact. Can you believe that you can snag all of those + the bonuses for only $97? The catch is it’s only available for a short time – and I really don’t want you to miss out on a deal this great! You can buy your copy of the GBTK 2018 >>> HERE <<<! What resource are your most excited about? Let me know below in the comments!